In the context of oil hydraulics, a solenoid valve can be either of spool or poppet construction. A solenoid is essentially an electro mechanical device consisting of a ferrous metal core inside a copper winding called a coil. When an electrical current passes through the copper coil, it creates a magnetic field. It either attracts or repels the ferrous core to the magnetic field, depending on its polarity. The polarity and magnetism cause the ferrous core to move the attached spool of the hydraulic valve. The latest will then determine the direction of flow of oil through the valve. In order for a valve to be ‘Proportional”, the electrical signal to the winding is a controlled variable current, and the design of the spool allows for a controlled variability of the oil flow. Furthermore, HYDAC solenoid valves offer pressure relief, pressure reducing and flow control valves. 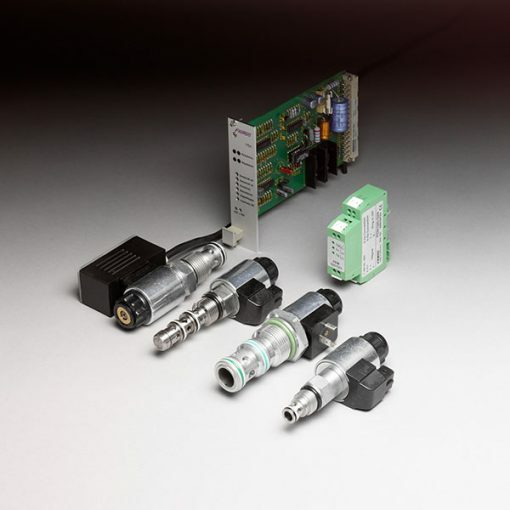 The utilisation of proportional hydraulic solenoid valves is common in industrial hydraulics, but particularly common in mobile hydraulic applications. What is the difference between Industrial Hydraulics and Mobile Hydraulics? Industrial hydraulics: Its utilisation is for the control of machines used in all manner of industry. E.g. manufacturing, where there are requirements for high speed and high volume production in order to control large cylinders or hydraulic motors. Or for controlling the hydraulic cylinders that operate the slues gates for water management of a hydro-power generator. Hydraulics drive these and many more machines that function in all manner of industries. And the management of those hydraulics is by proportional controlled solenoid valves. For more information, contact HYDAC today.